Always wanted a Jeep...two years ago my dream came true! Advertised an an '85 CJ 7...turned out to be an '84. Class of '84 parties more so it was fate. Came with 2-inch lift...I added shackles...fabulous 35" mud terrain tires...and a 6 cylinder 4.2L engine...ran perfect! Lots of Frankenstein welding just up my alley. Since then we have traveled to and from work and mudded our way all around south Florida. Recently MacMuzzy has become a money maker running West Palm Beach and winning at Devil's Garden...Gittyup! Larry's Comment: "Money Maker"...wow, that's a switch. Most Jeeps empty pockets rather than fill them. How do you get in on this Florida action? Not too familiar with Devil's Garden, but from what I have read it is an offroad mud racing park...no? 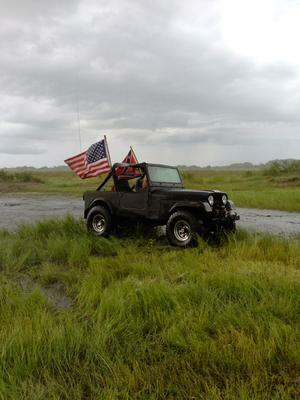 I am a glass half full kinda girl...yes we have had our fill of "birthday carburators"... West Palm Beach has class A side by side every three months...Devils Garden Mud Park in Clewiston has races every time they have an event...fabulous track...my Jeep actually ran with two different drivers...gittyup! !